Interstate 675 (Georgia 413) provides an alternate route to Interstate 75 northward from Stockbridge in Henry County to the Perimeter Highway (Interstate 285) in southwest DeKalb County. The freeway doubles as a commuter route for unincorporated suburbs in Clayton County while serving redevelopment of Fort Gillem to the west. The freeway appears rural with a wide median and only four lanes north from I-75 to the Double Bridge Road overpass and six lanes from Forest Parkway north to I-285. Road work scheduled for 2019 will modify the Interstate 285 interchange at Bouldercrest Road into a parclo. Associated work adds a new distributor roadway from Bouldercrest Road to Interstate 675 south, separating weaving traffic movements from the Perimeter Highway westbound mainline. 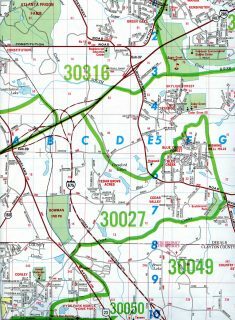 Interstate 675 was originally planned to be part of a longer route, as part of a proposed Interstate 475 / Georgia 400 freeway that would have extended north of Interstate 285 through the east side of Atlanta. 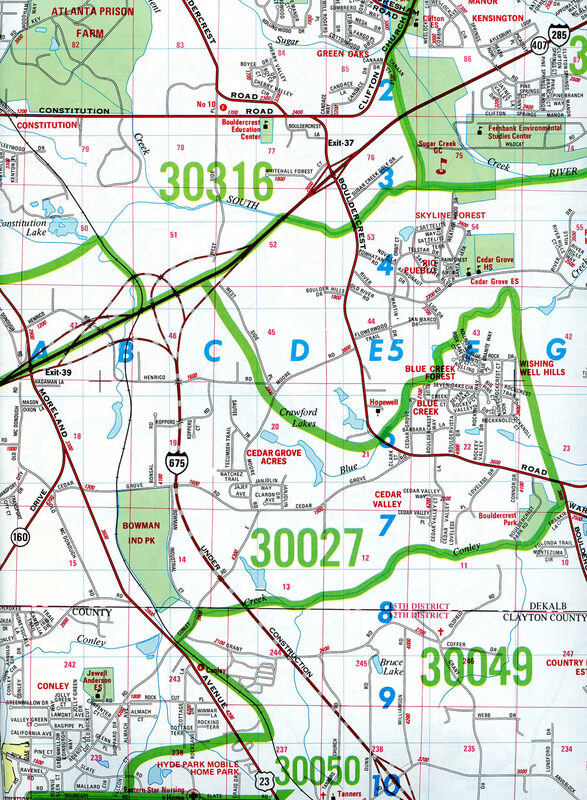 The route was envisioned to run to the south end of U.S. 19 & Georgia 400 (North Fulton Expressway) at I-285 in Sandy Springs. The northern third of this highway was constructed as the tolled extension of Georgia 400. The remainder between I-285 in DeKalb County and I-85 at Lindbergh in Atlanta was unbuilt. Atlanta street atlas page showing Interstate 675 under construction leading north to Interstate 285 in 1984. The proposed ramp from I-675 north to I-285 south was erroneous. The adjacent diamond interchange between Interstate 285 (Perimeter Highway) and U.S. 23 & Georgia 42 (Moreland Avenue) was modified with construction of the directional T interchange with Interstate 675. Ramps were added to consolidate movements from I-675 north and I-285 west to U.S. 23 and from U.S. 23 north to I-285 north and I-675 south. Interstate 675 leads four miles north from the final mainline interchange at Anvil Block Road to the terminus at Interstate 285. A series of diagrammatic signs outline the movements to the Perimeter Highway starting with this sign at the Cedar Grove Road overpass. Photo taken 10/22/15. One-half mile remains before the conclusion of Interstate 675 north. Local drivers bound for Atlanta are advised to use Interstate 285 west. Photo taken 10/22/15. A pair of end shields are posted as the roadways of Interstate 675 separate toward I-285 at the Henrico Road underpass. Photo taken 05/28/05. Motorists are reminded of the connections Interstate 285 makes with I-20 east for Augusta and I-85 north for Greenville. The outer loop of I-285 reaches the Tom Moreland Interchange with Interstate 85 in 19 miles. Photo taken 10/22/15. Two lanes part ways for Interstate 285 west toward Hartsfield-Jackson Atlanta International Airport (ATL) and Interstate 285 east and north toward Decatur and Stone Mountain. Photo taken 10/22/15. The close proximity of the I-285 interchange with U.S. 23 & Georgia 42 allows for a connection from the westbound ramp from I-675 north. Photo taken 10/22/15. Original button copy diagrammatic signs for Interstate 285 on I-675 north were carbon copied by 2003. Photo taken by Jim K. Georges (07/99). A second button copy diagrammatic sign preceded the directional T interchange with Interstate 285. Photo taken by and Jim K. Georges (07/99). More original button copy signs for Interstate 285 and since removed lighting fixtures. Photo taken by Jim K. Georges (07/99). I-285 advances one mile west from the diamond interchange (Exit 51) with Bouldercrest Road to meet I-675 south. Road work projected for 2019 will add collector distributor roadways along both sides of the Perimeter Highway to eliminate weaving traffic between Exits 51 and 52. Photo taken 07/02/17. A new sign bridge installed in 2016 included the first of two arrow per lane (APL) signs for the two-lane off-ramp (Exit 52) for Interstate 675 south. Photo taken 07/02/17. Interstate 675 branches southeast from a directional T interchange (Exit 52) with Interstate 285 to Ellenwood and Stockbridge. Photo taken 07/02/17. Two miles ahead of Exit 52 with Interstate 675 south on I-285 west (inner loop) at the Clifton Springs Road overpass. Photo taken 07/31/11. New signs added to the Bouldercrest Road overpass by August 2016 include an advance sign for U.S. 23 & SR 42 and replacement overhead for Interstate 675. The southbound control city of Macon is located 71 miles away via I-75. Photo taken 07/05/14. An auxiliary lane from Bouldercrest Road defaulted onto Interstate 675 south beyond the South River and this sign bridge. Photo taken 07/05/14. This sign bridge at Exit 52 was replaced by 2016 with a new assembly. Montgomery emerges as a control city for Interstate 285 here. The Atlanta Beltway reaches I-75 in six miles and I-85 in nine miles. Photo taken 07/05/14. Two miles ahead of Interstate 675 south (Exit 52) on I-285 east at the South River Gardens neighborhood of southeast Atlanta. Photo taken 06/12/17. Back to back ramps depart from Interstate 285 east, 0.75 miles beyond the Forest Park Road SE overpass for U.S. 23 & GA 42 (Moreland Avenue) and Interstate 675 south. Photo taken 06/12/17. The diamond interchange with U.S. 23 & GA 42 (Moreland Avenue) includes ramp connections with the adjacent interchange at Interstate 675. Motorists on the I-285 mainline join I-675 south ahead of the Moreland Avenue on-ramp. Photo taken 06/12/17. A long sweeping ramp (Exit 52) departs Interstate 285 east for I-675 south to the Clayton County suburbs. Interstate 285 progresses eastward with four lanes toward the communities of Gresham Park and Panthersville otherwise. Photo taken 06/12/17. Two mile advance sign for Interstate 675 (Exit 52) on I-285 east at the SR 54 (Jonesboro Road) overpass. Photo taken 01/16/04. New signs replaced this set of signs on I-285 east for Interstate 675 south and U.S. 23 at the Forest Park Road overpass in early 2017. Photo taken by Chris Patriarca (02/23/03). U.S. 23 & Georgia 42 (Moreland Avenue) pass over the Perimeter Highway one quarter mile west of I-675. This overhead assembly preceded the Moreland Avenue overpass along eastbound I-285. It was replaced by 2017. Photo taken by Chris Patriarca (02/23/03). Motorists bound for Interstate 675 south toward Macon departed from Interstate 285 east at these former overheads. Photo taken by Chris Patriarca (02/23/03). U.S. 23 & SR 42 switch sides with Interstate 675, two miles north of its merge with I-75. A dynamic message sign here advises commuters of the status for the reversible I-75 South Metro Express Lanes at the southern terminus of I-675. Photo taken 06/12/17. Interstate 675 south meets Georgia 138 at diamond interchange (Exit 1) just prior to the merge with I-75 southbound through south Stockbridge. Photo taken 06/12/17. Toll rates for the I-75 South Metro Express Lanes vary depending upon traffic congestion. Photo taken 06/12/17. Two lanes default onto the southbound mainline of Interstate 75 from I-675 while a left-hand ramp joins the Express Lanes to McDonough. Photo taken 06/12/17. Like the southern terminus of Interstate 575, Interstate 675 concludes at a wye interchange with no return access to northbound Interstate 75. Georgia 138 (Lake Spivey Parkway) provides a connection to I-75 north to Morrow via a diamond interchange located 0.6 miles to the west. Photo taken 07/05/14. End shields were posted on the transition ramp from I-675 south to I-75 south until 2007. Photo taken 01/17/04. Interstate 75 pushes north with four general travel lanes toward the wye interchange (Exit 227) and split with Interstate 675 north. Completed in January 2017, the reversible I-75 South Metro Express Lanes accompany the freeway northward to the suburban route of I-675. Photo taken 06/30/17. Traffic bound for the Perimeter Highway west is advised to take I-75 north for College Park and East Point. I-675 provides a direct route to I-285 east for the Dekalb County suburbs of Clarkston and Tucker. Photo taken 06/30/17. The I-75 South Metro Express Lanes end with ramps to both the I-75 mainline ahead of Morrow and Forest Park and Interstate 675 north to Dekalb County. Photo taken 06/30/17. Exit 227 separates from Interstate 75 north with two lanes for Stockbridge, Ellenwood and Gresham Park. The north end of I-675 ties into I-285, six miles west of Interstate 20 near Panthersville. Birmingham joins Atlanta as a control city for I-75 north, referencing the I-285 inner loop to I-20 in West Atlanta. Photo taken 06/30/17. Two miles south of the Interstate 75/675 split at the Flippen Road underpass was the first guide sign of Exit 227. Photo taken by Chris Patriarca (02/23/03). This diagrammatic overhead was removed when the Walt Stephens Road overpass was replaced to accommodate widening of Interstate 75. An arrow per lane sign took its place just to the south. Photo taken by Chris Patriarca (02/23/03). Two lanes were available for Interstate 675 north from I-75, while the freeway mainline north toward Atlanta retained three through lanes. Photo taken by Chris Patriarca (02/23/03). This supplemental sign was removed by 2008. It encouraged motorists bound for Augusta or Greenville to use Interstate 675 north for I-20 east or I-85 north. Photo taken by Chris Patriarca (02/23/03). A forested median previously separated the Interstate 75 roadways to Exit 227. Trees were eventually cleared to accomodate the I-75 South Metro Express Lanes. Photo taken 10/22/15. Interstate 675 north began as Interstate 75 turned northwest for the 20 mile drive to Downtown Atlanta. Photo taken by Chris Patriarca (02/23/03). Reassurance markers were posted along both sides of Interstate 675 immediately after the separation with I-75. Button copy I-675 shields here were replaced by 2012, and this scene changed substantially with the addition of ramps for the I-75 South Metro Express Lanes. Photo taken 05/28/05. “I-675 open to traffic.” The Atlanta Journal and The Atlanta Constitution, November 5, 1987. “GDOT Celebrates the Completion of the I-75 Express Lanes at Ribbon Cutting.” Georgia Department of Transportation, announcement. January 26, 2017.